I don’t remember if I bought this before or after Their Satanic Majesties Request. I feel like it was after, because my earliest memory of having it was living in my duplex after college, when I distinctly remember putting the ticket from seeing the Stones on the ’99 No Security Tour into the CD booklet. That ticket is still there. It was my very first concert to see a big-name Rock band, unless you count the time House of Pain came to my college, which I don’t (the They Might Be Giants/Violent Femmes show, on the other hand…). I bought the tickets last minute: they were rear-view for $50 apiece. I bought four, got two of my friends to go, and sold the last one at face value to a scalper on the way in. It’s the only time I’d ever seen the Stones, and I thought it was great. For that matter, I still do. 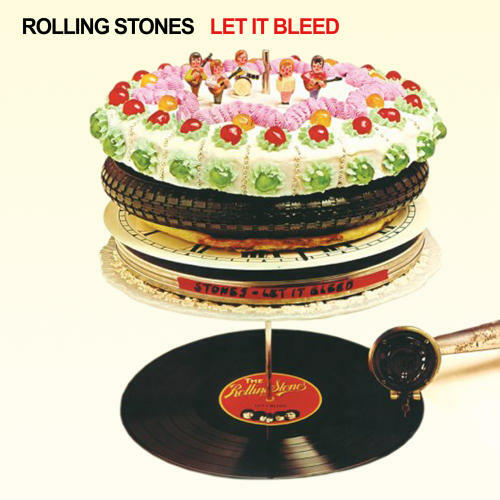 Let it Bleed is an easy album to like. It’s one of the Holy Quadrilogy of Stones albums from their ’68-’72 peak. It opens with “Gimme Shelter” and closes with “You Can’t Always Get What You Want.” There’s some filler, but not much, and as filler goes, vastly exceeds the filler on later albums (listen to “You Got the Silver” and then “Far Away Eyes” from Some Girls. I dare you). This was a band at the height of their craft, and they sound like they’re enjoying themselves. Joy is not a word that gets associated with the Stones a lot. Their image – R&B badboys swaggering and sneering – pushed away from that. But joy is the mood this album puts me in. Even the supposedly dark songs, like “Shelter” and “Midnight Rambler” are fairly bursting with toe-tapping energy. “Rambler,” despite being about the Boston Strangler (or something along those lines), seems entirely-tongue-in-cheek. Keith Richards, in his perfectly rambling Autobiography, Life, said that the lyrics were just snatches of ideas in headlines. This rings true. It’s hard to imagine the Stones taking anything seriously in 1969, even with the death of Brian Jones and, later that year, Altamont. Even “Sympathy for the Devil,” still their most chilling song, has a joke at the center of it: the devil is a gentleman, and whatever his crimes, has an expectation of courtesy. You don’t survive in the music business for fifty years by taking matters of life, death, and evil seriously. That ain’t your job. So for me, the album’s real centerpiece is the title track, which grants a kind of grace to the listener. We all need someone to bleed on; you’re screwed up, I’m screwed up, but it’s okay. When Mick drawls “Bleed it all right,” while Charlie bashes the cymbals, I feel the happiness roaring out of my speakers, like the mood at a hippie wedding after a food fight when the bride is still laughing. It’s all gonna be all right. I’d go so far as to say that this was my favorite Stones album, maybe. It depends on my mood, to be honest. Exile on Main Street has really grown on me, truth be told, and I do like Out of Our Heads and Aftermath (which I have on vinyl). I will say that no matter how many times I’ve heard it, or how long I go without hearing it, that I never ever tire of it. Like the Stones themselves, it’s like an old friend.